The audio cabinet was designed to accomodate a record player on top with supporting amps, speakers and vinyl storage below in shallow trays or shelves. There is also ample space for digital systems as well. Wire management is fully considered with discrete grommets throughout and removable panels at the back for easy access (the back can be displayed). 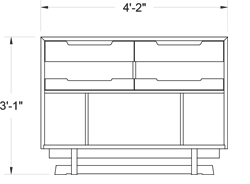 The cabinet can be configured in several ways and may be used beyond its audio function as a sideboard. Custom modifications will be considered.